As I sit and wait at sun rise in the no-mans land between Pakistan and Iran, I patiently wait for the Iranian border gate to open. I have learned that the Baluchi, Pakistan people are as jovial as it gets, with a laugh that jiggles their bellies, a laugh that Santa would be proud of. 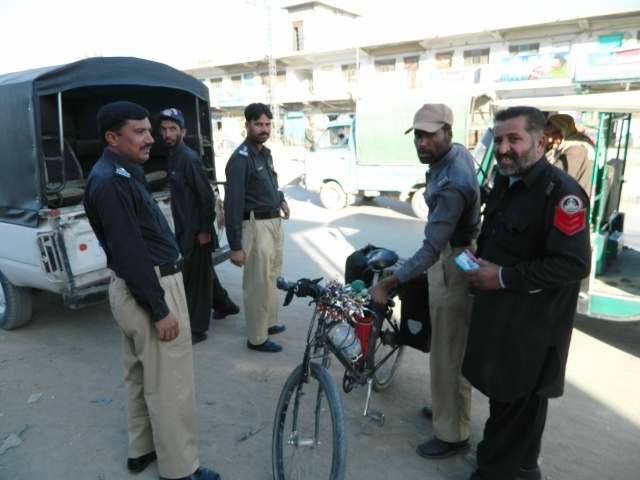 The Pakistani military police and I have become intimately acquainted lately when I was scooped up in Quetta in the Baluchistan province and prevented from cycling the majority of the way to the border by some surprisingly super fun police. I cycled the remaining KM to the border at sunrise keeping a low profile. 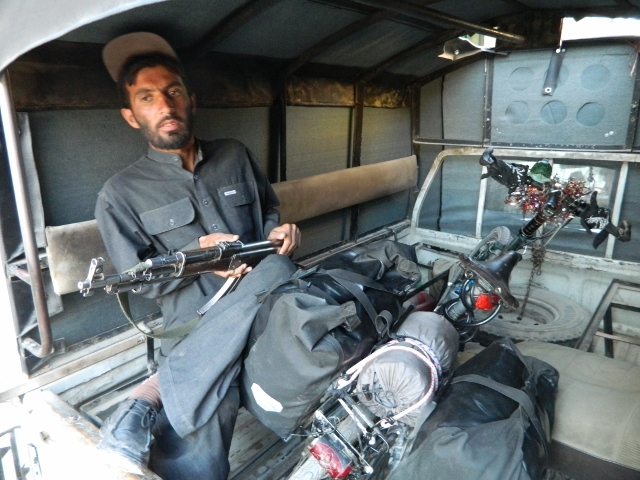 I park Pandemic the magic bicycle with the Pakistani border police, sit and wait for the Iranian gate to open. I get to chatting with one of the guards. He tells me, he is looking for a wife and the rest of Pakistan has gotten too liberal and it is not good. Funny enough, he is very handsome and has a likeable demeanor, which is, until he starts talking. He is what I would call an unique conservative man and not your average Pakistani. He tells me with a big friendly smile , that he is 25 years old, that he can’t wait to become a man, he asks me how many women the boys at home have slept with at 25, and says he has only slept with one, he tells that my downtown area has gotten too old for these sort of things because of the cycling. As the sun continues to rise, I am trying not to laugh and therefore encourage any conversation that may take us further downtown or encourage a debate about the present fitness status of my aging hoohaa. I put on my best curious travelers smile and sit back and listen. He continues with his views about how women are to stay at home and only after having birthed two boy babies will his wife be allowed to leave the house wearing a burka with full face coverage to go to the market. She will not be allowed to have friends, an education after 10th grade, and marrying at 15 is good. He is considering having a couple of wives, he is allowed 4. However, he is not sure he can afford it. You have got to love money for at least that, I think to myself. I ask him about some burn marks I have seen on some women’s faces, he tells me she did something at home and it’s ok that the man burns and/or beats her. As my teetering smile and eye balls pop out, I force myself to keep listening. I am genuinely fascinated and try to be respectful of differences; however, I think my tongue might be bleeding. I asked the guard what he thinks about me. 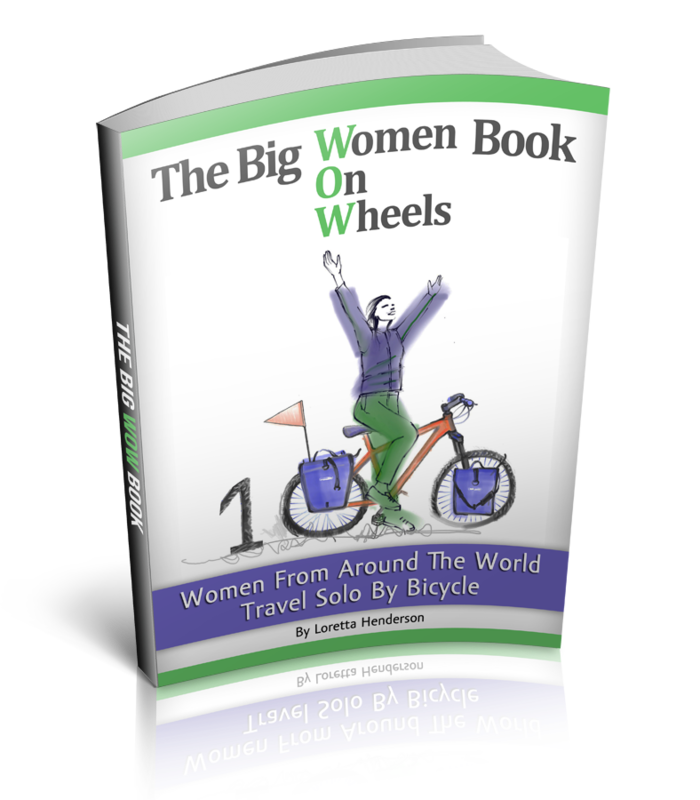 As a women bicycle travelling alone in Pakistan, I have often felt guilty about my tremendous freedom and significantly concerned about my sisters of the world. He says he thinks it is fine and wonderful because I am not a Baluchi woman. I wished him well finding his 4 wives, apologized that I wasn’t a polygamist and off I went pedaling into Iran on my aging hoohaa grateful for the education and that much more concerned about some of my sisters in Baluchistan. Oh you've just woken up my house!! I was awake too early this morning and was trying to be quiet! Then I read your post and despite its serious undertones, I was giggling hysterically by the time I got to the end. My mother and son are now glaring at me for waking them up! Thanks for a really good laugh!! !